Meet the Beatles! Just one month after they exploded onto the U.S. scene with their Ed Sullivan Show appearance, John, Paul, George, and Ringo began working on a project that would bring their revolutionary talent to the big screen. 'A Hard Day’s Night,' in which the bandmates play slapstick versions of themselves, captured the astonishing moment when they officially became the singular, irreverent idols of their generation and changed music forever. Directed with raucous, anything-goes verve by Richard Lester and featuring a slew of iconic pop anthems, including the title track, “Can’t Buy Me Love,” “I Should Have Known Better,” and “If I Fell,” 'A Hard Day’s Night,' which reconceived the movie musical and exerted an incalculable influence on the music video, is one of the most deliriously entertaining movies of all time. John, Paul, George, and Ringo. The Beatles. The Fab Four. Legends, icons, and lasting pop culture sensations -- what is there really left to say? In fact, so much has been written about the band, that I'm sure even my previous sentence lamenting the fact that there's nothing left to say about them, has already been written countless times before. Still, the relentless coverage is fully deserved. After all, though once just four humble lads from Liverpool, the group is collectively responsible for producing some of the most popular and enduring musical hits ever recorded. 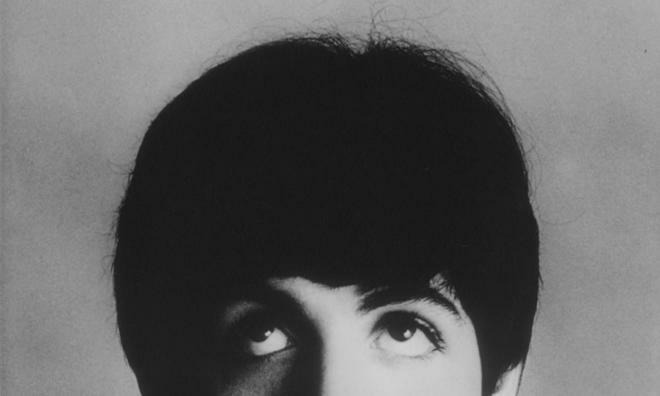 And as their fame shot up in America, right at the height of Beatlemania, they of course… made a movie. From director Richard Lester, 'A Hard Day's Night' is an innovative, experimental foray into satirical, surreal comedy, loose plotting, and frenzied musical performances. A highly influential work, the film essentially lays down the groundwork for a whole new form of movie musical, paving the way for pop music videos as we know them. The basic plot focuses on the famous quartet over a single day as they rehearse for a live television concert. We follow band members John Lennon, Paul McCartney, George Harrison, and Ringo Starr (all playing themselves, of course) as they take a train ride, practice their songs, and chat up women, all while they continuously deal with mobs of fans, controlling managers, and overbearing press. Though there actually is a script, the story is essentially negligible, with the film's goals extending far off the usual narrative path, aiming for a more unconventional and almost nonsensical mixture of episodic comedy and melodic delight. The humor itself is a fun blend of dry, witty one-liners, and odd, absurdist sensibilities –- which all end up mixing perfectly with the band members' actual personalities. Quick snippets of snarky banter and sarcastic observations are placed against more overtly wacky scenarios and reality bending visual gags that pay homage to silent cinema sensibilities. Likewise, frequent non sequiturs and meaningless observations are thrown into a gleefully haphazard series of sequences that see the band struggle to deal with the pressures surrounding them. Thankfully, not all of the laughs are purely irrational, and complementing the seemingly random, surreal humor is some occasionally biting satirical commentary on the pitfalls of fame and the superficiality of shifting trends. Some highlights include poor Ringo's unsuccessful attempts at enjoying the simple things in life, George's run-in with some shallow trend setters, and a lively press party that sees the band unleash an amusing assault of quick-witted jabs at the unsuspecting (and often oblivious) journalists. Going along with the narrative's decidedly loose construction, the musical performances themselves often come in the form of arbitrary breaks from the normal flow of the story. To this end, songs simply occur matter-of-factly with no real attempt at transitions or plot ties, yet somehow the filmmakers manage to maintain an effortless flow and rhythm throughout the entire runtime. A more traditional approach is taken for the climax, however, which sees the band literally play for a television concert. Multiple cameras capture every angle, giving the viewer an intimate and multifaceted view from both the audience and the group's perspective. 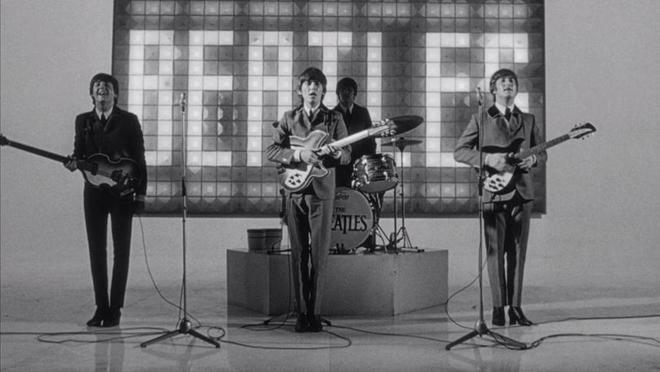 Of course, the opening sequence itself, set to the title track of the film, is perhaps the movie's most iconic scene, and The Beatles running through the streets of Liverpool has become an indelible motion picture image, loudly ushering in a new kind of filmmaking -- complete with a catchy, memorable hook. Brilliantly tying the film's loosely constructed web of comedy and song together, is director Richard Lester. Bringing an innovative and energetic visual style to the screen, Lester basically pioneers an entirely new method of filming musical performances. Many scenes forgo classic coverage in favor of a more improvisational, free-flowing approach that relies on unconventional editing techniques. The frenzy of Beatlemania is perfectly captured through montages of shaky close-ups depicting screaming fans and pandemonium on the streets. Fast moving zooms and pans all add energy and excitement, following the band wherever they go. Lester also plays around with frame rates, using slow and fast motion to capture the group's free-spirited whimsy. And all of this kinetic style creates a kind of invisible throughline, connecting the songs and story in a purely cinematic way. While there's no denying the movie's heavy influence and impact on creating a new kind of synergy between film and popular music, 'A Hard Day's Night' doesn't quite hold the same impact that it once did. The movie has aged remarkably well and never really feels dated per say, but techniques and stylistic choices that once seemed radical and subversive in 1964 are now rather standard and common place. Of course, this isn't a real fault of the film itself. In fact, it's just further proof of how remarkably ahead of its time it really was. With that said, the movie's effect can't help but be slightly diminished by the generation of imitators that followed. With their albums, The Beatles helped shape popular music as we know it, and through their first attempt at big screen success, they help establish an entirely new form of moviemaking. Lester's irreverent mishmash of zany nonsense, sharp satire, exciting visuals, and great music, results in a genuinely original and downright groundbreaking accomplishment. It may not hold the impact it once did in 1964, but 'A Hard Day's Night' remains an entertaining, funny, and artfully constructed peek into the fascinating world of celebrity and rock and roll -- giving playful cinematic form to the madness that is Beatlemania. Criterion presents 'A Hard Day's Night' in a Dual Format Blu-ray/DVD combo pack. A BD-50 Region A disc and two DVDs come packaged in a foldout case housed in a cardboard slipcover with spine number 711. An extra thick booklet featuring an essay by critic Howard Hampton and excerpts from a 1970 interview with the director is also included. The movie is provided with a black and white 1080p/AVC MPEG-4 transfer in the 1.75:1 aspect ratio. Director approved and taken from a new 4K scan sourced from the original 35mm camera negative and two fine-grain master positives, the picture here is very impressive, giving the movie the top quality video presentation it deserves. Compared to the previously released 1080i Alliance disc, this new transfer offers a huge upgrade in every conceivable way. While that disc had a soft, flat, and slightly washed out image with occasional signs of damage, here we get an absolutely beautiful presentation. The print is in great shape with only very minor specks and lines from time to time. A natural layer of grain is apparent throughout, giving the picture a rich, filmic quality. Clarity is strong, with a pleasing level of fine detail and a solid sense of dimension. The black and white photography features strong contrast with bright whites, deep blacks, and a well-balanced grayscale. Thankfully, there are no artifacts to speak of. 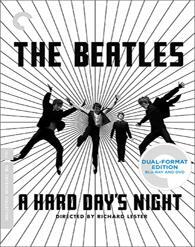 This Criterion release of 'A Hard Day's Night' gives fans an exceptional video presentation, offering a big improvement over the previously available Canadian import. The film is presented with the original English LPCM Mono track and a newly mixed English LPCM stereo track and English DTS-HD MA 5.1 track. Enveloping but respectful, this is a fantastic surround sound remix, opening the audio and music just enough without overpowering the original design work. Dialogue is clean and clear throughout and there are no major signs of pops, background hissing, or crackle. The soundstage itself is very restrained, remaining respectful to the original mono design, though speech is appropriately positioned in the center channel, sound effects are subtly expanded across the front speakers, and faint ambiance is spread to the rears (a moving train, screaming fans, etc.). Where the remix really shines, however, is with the music performances. From the moment 'A Hard Day's Night' comes bursting from the speakers, it's clear that great care has been taken to present the songs, and the audio features fantastic fidelity with a rich and full sound. Separation is great throughout the soundstage, spreading the music all around the room in a smooth and natural manner. Bass activity is also solid, giving a little extra kick to the rock tunes. Likewise, as was the case with the video, this 5.1 track is leaps and bounds better than the inconsistent 5.1 mix used on the Alliance release (which was really more of a mono/2.0 hybrid). With that said, the transition from narrative scenes to musical performances can still be a tad jarring, as there is a clear increase in audio quality (though this is also the case in the mono and stereo mixes.) I also sampled the original mono and stereo tracks, and they also offer great audio experiences. Of course, the mono track features a comparatively tiny and flat soundfield that lacks the full resonance of the new mixes, but it really is impressive in its own right and it's great to have the film's original audio as an option. Supervised by sound producer Giles Martin (son of George Martin, The Beatles' original producer), the new 5.1 track does a great job of expanding the audio in subtle and respectful ways. Likewise, fans also get the original mono track and a 2.0 option, offering three great ways to listen to the movie. Criterion has provided a great assortment of supplements including a commentary and several documentaries. With that said, a few of the previous featurettes from the Alliance release are not included here, but most of the information shared in those pieces is also touched upon in separate supplements here. All of the special features are presented in 1080p with Dolby Digital 1.0 audio and no subtitle options (unless noted otherwise). Commentary by Cast & Crew – Produced in 2002, this track features actors John Junkin, David Janson, Jeremy Lloyd; cinematographer Gilbert Taylor; associate producer Denis O'Dell; and many other members of the cast and crew. The large group offers a steady stream of trivia and anecdotes from the production and touch upon how certain shots were accomplished, what it was like working with the band, locations, wardrobe, influences, editing, casting, and insights into The Beatles' personalities. Though it can be a little hard to tell who is talking from time to time, this is an informative track. In Their Own Voices (HD, 18 min) – This is a reel of 1964 audio interviews with the band set to stills, behind-the-scenes footage, and clips from the film. The band discusses how they got involved in the project, the writing process for the title track, their experience shooting the film, what it was like to act as themselves, and how they go about dealing with the press. Serving as the only supplement that features participation from the actual Beatles, this is a great inclusion that fans should enjoy. Anatomy of a Style (HD, 17 min) – In this featurette, story editor and screenwriter Bobbie O'Steen and music editor Suzana Peric analyze five music scenes from the film. The duo elaborate on the movie's use of style as content, its experimental editing techniques, its shot selection, and the unconventional manner in which it uses music to tell a story. "You Can't Do That": The Making of 'A Hard Day's Night' (HD, 1 hr & 2 min) – Presented in 1080i with Dolby Digital 2.0 audio, this is a 1994 documentary hosted by Phil Collins that traces the movie's production. Audio snippets from the band are repeated from one of the previous supplements, along with interviews from the director, cast, crew, and even Roger Ebert. The participants discuss the origins of the film, the writing process for the music and script, the use of adlibbing, cut songs, the visual style, and the movie's lasting impact. We also get to see an outtake performance that was not used in the final edit. Things They Said Today (HD, 36 min) – Presented in 1080i with Dolby Digital 2.0 sound, this is a 2002 documentary that offers another look back at the origins of the film, its production history, and lasting impact. Interviews with director Richard Lester, George Martin, producers, studio execs, and other crew and cast members are included, along with some behind-the-scenes footage and stills. All of the participants offer some interesting bits of trivia and stories from the set dealing with the improvisational style of filmmaking used and the band's impossible popularity. There are some repeated stories and trivia, but fans will still want to check this out. The Beatles: The Road To A Hard Day's Night (HD, 28 min) – Here we get a 2014 interview with Beatles' author Mark Lewisohn discussing the band's early career leading up to 'A Hard Day's Night.' Filled with lots of interesting trivia, this is a great inclusion. Trailers (HD) – The film's 2000 rerelease trailer (2 min) and its 2014 rerelease trailer (2 min) are included in 1080i and 1080p respectively with Dolby Digital 2.0 sound. Richard Lester's 'A Hard Day's Night' is a highly influential and entertaining musical comedy that brings Beatlemania to the big screen in style. While some of its impact has dulled over time, the film is still a playful and innovative piece of motion picture history. Improving upon the previous release in every way, the new video transfer is exceptional. Likewise, fans are given three great audio options, including the original mono soundtrack and a new, very respectful 5.1 remix. Supplements are plentiful and informative, though it would have been nice to hear retrospective interviews from the surviving band members. Still, this is an all-around fantastic release from Criterion –- one that is easily a must own for any big Beatles fan and highly recommended for all film fans.